The Social Security Administration does not make it easy for people to get benefits if they are disabled. About two-thirds of all Social Security disability applications are denied. Many folks who have legitimate disabilities and deserve benefits give up. This is a mistake. It's important to pursue an appeal if your Social Security claim has been denied. Your odds of success increase as you move through the appeal stages. More than half of the applicants who appeal eventually are approved for Social Security Disability Insurance (SSDI) benefits. 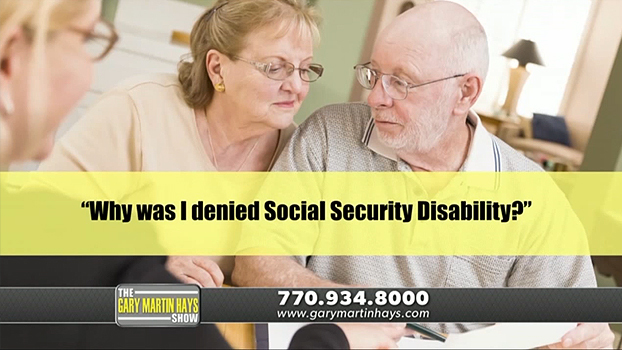 In this video, lawyer Gary Martin Hays discusses some of the most common questions asked about social security disability benefits. If you've been denied Social Security Disability Benefits, please talk to a lawyer right away. Success on appeal often is possible because claimants hire an experienced Social Security disability attorney. With a knowledgeable attorney on your side, you have an advocate who understands the system and can personally present your case to an administrative law judge if necessary. Your attorney can help you make the right decisions in presenting an appeal after a denied Social Security claim. Reconsideration: After your initial claim is denied, a disability examiner will look at your claim and decide to approve or deny the claim. Administrative law judge: You or your attorney can present your case before an administrative law judge (ALJ). More than half of all denied claims are successful at this stage. Appeals Council: If the ALJ rejects your claim, you can appeal to this group, which reviews the ALJ's decision. Federal courts: If the Appeals Council denies your Social Security claim, you can file a civil case in federal courts. At Gary Martin Hays & Associates, our attorneys are dedicated to making a meaningful difference in clients' lives. We have a record of success in pursuing Social Security disability claims. Don't let a denied claim derail your life. Call 1-800-898-HAYS or contact us online.